Nestled at the foot of the wooded slopes of Mount Meru, this unique hotel stands amid Coffee plantations on the shores of tranquil Arusha Serena Hotel Resort & Spa. 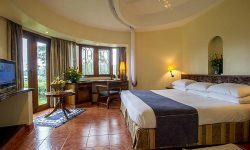 Designed to echo the traditional style of the colonial coffee farm, which originally stood on this site, Lake Duluti Serena Hotel offers a range of tastefully presented cottage-styled rooms set amid extensive landscaped grounds. The Hotel has 42 en-suite guest rooms, All Non-Smoking 1 (Pair) Connecting Room (1 room for the physically challenged. Arusha Serena Hotel Resort & Spa is 15 kms from Arusha town, a 20 minutes’ drive, 40 kms to Kilimanjaro Airport, a 45 minutes’ drive, Telephone and Free Wi-Fi connectivity, Complimentary mineral water and Toiletries, Hair Dryers. The Hotel has a 24 hour on call medical services, 24 hour electricity, Baby-sitting, children’s Dining/menus, Laundry and shoe-shine, Forex Exchange, Safety Deposit Box, All day complimentary Tea and Coffee . There is a well stocked Gift shop, Safari boutique, Internet, ·Restaurant and bar. If guests have a special dietary needs catered for E.g. Vegetarian, Kosher, Gluten free with advance notification. Picnic lunch boxes on request. Arusha Serena Hotel Resort & Spa has a wonderful Massage Services, Guided nature walks/ bird walks, Board games and library, Swahili Language Lessons, Cooking Lessons. The Hotel is Child friendly offering Babysitting, Children’s Dining menu.